One day in April 1937, Picasso who stayed in Paris in order to avoid the wars heard the news that, the small beautiful commercial town of Spain-Guernica was blasted into ruins by the bombers of German. There were full of people at that time in the streets, and the innocent residents were massacred. Picasso was shocked by the series of savage brutalities and turned his depressed mood into anger. He decided to expose these outrageous brutalities by using his brush as the weapon. Interestingly, we could not find a similar example in the previous works had the same performance practices of this oil painting “Guernica” which was related to the war. For instance, the “Chios Massacre”, the “Raft of the Medusa” and the “May 3, Madrid”, all these works described the scenes of the wars with realism in order to record the history and bring the history alive. The realism was the accepted technique at that time, was the model of depicting large-scale war scenes. Uncharacteristically, Picasso used the abstract symbolism technique. When Guernica was exhibited in European after it was finished, it did not received any criticism, and on the contrary, gained wide praises. 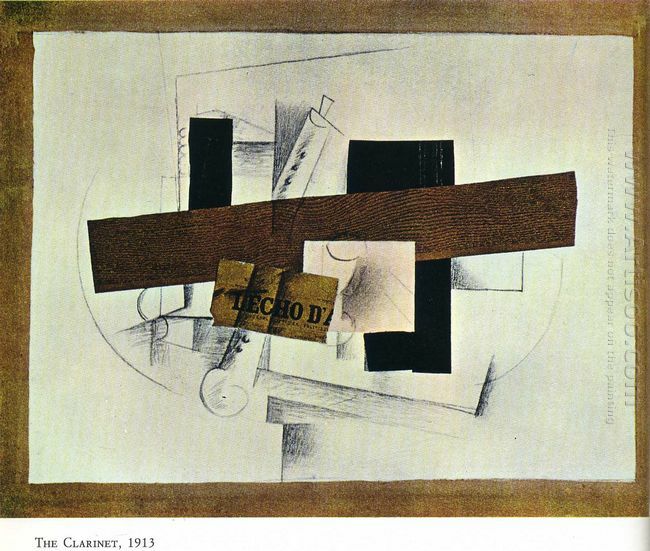 Abstractionism and cubism were just becoming popular at that time, there was only a little group knew what it was. It could be said that, Picasso created the Cubism. Before the work of his “Guernica”, there was no one used the abstractionism or symbolism techniques depict such a serious theme and such a huge work. Until today, the westerners do not accept abstractionism completely. The generation of the abstractionism brought a proposition that “Arts are not necessarily to be beautiful”. This proposition marked the complete break of the modern art and traditional art. What Geurnica shows isn’t the out-and-out modernism in front of people? The Liberty Leading The People was based the July Revolution in 1830. France was undergoing the second restored bourbon in order to strengthen the imperial power, announce the dissolution of Parliament and restrict citizen’s right to free elections and publishing. A man named Clara Lessing firstly lifted the symbol of the French Republic tricolor flag; the young Allaire inserted the flag to a bridge near Notre Dame de Paris and shot down. The young girl in the painting held the flag with one hand in the smoke and held a gun with another hand. She fought at the head and was calling the masses to move forward. The color of a person’s coat, the exposed shirt and belt next to her was the same as tricolor flag. A republic flag flying above the north tower was vaguely seen. Looking forward to the coming of freedom was a true portrayal of the uprising participants. This painting was based on the final screen of hundreds of “July revolution” sketch. The work showed the smoke of the street scene. This painting took the goddess image as a symbol of liberty. She held the flag high and led the revolutionary advance bravely. The painting was with great momentum and strong appeal, blazing with bold colors. 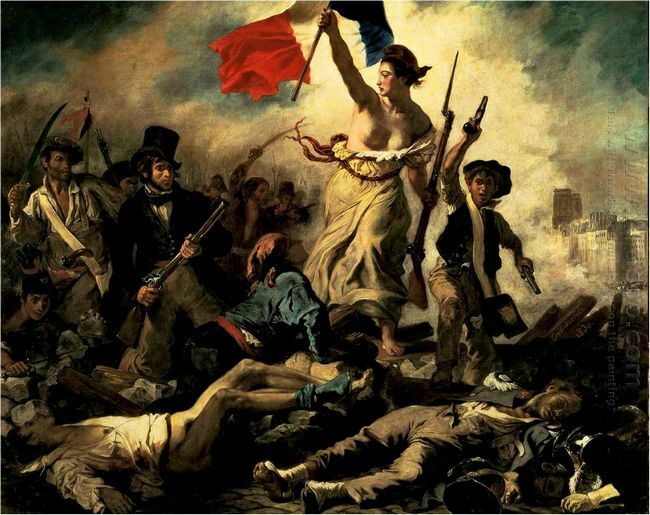 The Liberty Leading The People reflecting the revolution in 1830 was one of the most romantic Delacroix’s works. The painter praised the revolutionary movement of the workers, the petty bourgeoisie and intellectuals in the untrammeled enthusiasm. The image of women holding the flag of freedom of God here embodied the characteristics of romanticism. She was healthy, strong, resolute, beautiful and naive, who was leading workers and intellectual revolution team to forge ahead. Dramatic effect formed by the strong light, and rich and strong color and full of dynamic composition formed a strong, intense and passionate atmosphere, making the painting have a lively and exciting force. After Napoleon’s resignation in 1815, Louis XVIII who fled abroad returned to France and became the king, which was the “Bourbon” restoration and the feudal forces were rampant. In July 1830, Louis XVIII′s heir Charlie attempted to further restrict the voting rights and freedom of the press people and announced the dissolution of parliament. Paris residents upraised. They took up arms to the barricade and fought for the overthrow of the restored Bourbon. Finally they occupied the palace and Charlie fled to Britain. In 1822, the Turks occupied Chios island which belonged to Greece and plundered the whole island. Allegedly 23,000 civilians were killed and 47,000 people were sold into slavery. The invaders atrocities infuriated European progressives and also deeply angered the painter Delacroix. With great sympathy and vigorous conception, anemia core image and strong lyrical composition, the painter revealed the Turks atrocities. Scenes From The Massacre Of Chios and The Raft of the Medusa were based on a true historical event. In 1822, the Turks occupied Chios island which belonged to Greece and plundered the whole island. The invaders made one’s hair stand on end atrocities aroused great indignation throughout Europe progressive people who had accused Turkey of the aggressors. The great English Romantic poet Byron directly joined the fighting of the Greek people and sacrificed his young life. Facing the Turkey invaders committed great sin, Delacroix was filled with righteous indignation and had drawn out two works Scenes From The Massacre Of Chios and Greek on Miso Ron Ki Ruins, exposing the invaders atrocities, in support of the Greek people just war. From The Massacre Of Chios showed the painter’s solidarity and sympathy for the Greek people. In this painting, the painter concentrated on the color strength, and used the big bold strokes. Through the contrast of light and shade and the attitude of characters, the painter treated the complex turbulent and struggling panic scenes into two levels and the prospect of future for the performance of this tragedy. 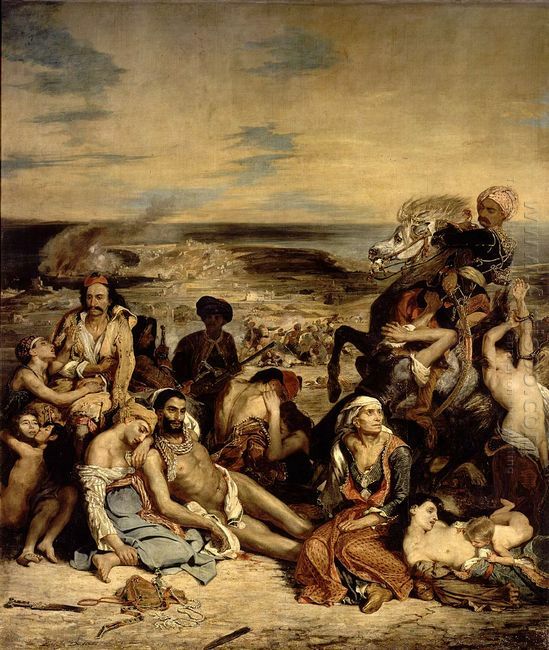 It was apparent that Eugene Delacroix was very concerned about the most sensitive humanity and justice in the life. Who has the attractions that make the super star Madonna regards her as idol? Who has the capabilities to set off a super cyclone in the United States and around the world? She was the first Latin American painter whose works were collected by the Louvre. Her autobiographical style made the feminists regarded her as the pioneer of expressing women identities. Her Mexican dresses were so strong that not only set off a popular trend but also been the theme of the fashion designer Guadi’s show. Interestingly, we could not find a similar example in the previous works had the same performance practices of this painting “Guernica” which was related to the war. For instance, the “Chios Massacre”, the “Raft of the Medusa” and the “May 3, Madrid”, all these works described the scenes of the wars with realism in order to record the history and bring the history alive. The realism was the accepted technique at that time, was the model of depicting large-scale war scenes. Uncharacteristically, Picasso used the abstract symbolism technique. When Guernica was exhibited in European after it was finished, it did not received any criticism, and on the contrary, gained wide praises. Geurnica did not started with the perspectives that waking up or calling on people to arm and fight against, neither did it was started with the perspectives of condemnations and protests. He showed it through the points of sadness, sorrow and fear. Although this was consistent with the characters of Picasso, but it was impelled to speak that it was a bold movement in the areas of art history. the brutal war through the view of a bystander. These were all the differences he had from the others. The reason why Picasso was the master because he knew what was his mission clearly and had the ability to complete the mission. Only through creating could he win the right to survive. Of course, the artistic creation also depends on the personality and courage of the artist. I feel that, the artists should always remind themselves that:” What should you do? What did you do?” The artists change their own destinies as well as change the society. The tolerant of the westerners towards the arts is actually the presentation of their respects of arts. could even let people learn some spiritual connotation. Through the collage, the artist would seem to have forgotten the performance factors, especially for the material and color aesthetic feeling to the viewers. This was clearly different from the interest of analytical Cubism style. This work also showed Georges Braque‘s great control and processing picture space power. If the analytic Cubism works in the treatment of space displayed was the dynamic and energetic feeling. So now in the exploration of this so-called Synthetic Cubism in combination, the picture presented a unique, stable and static trend. All the figures in the painting were all converged in the center of the oil painting. With a root and stable lines, the artist collaged the graphics to further strengthen the centripetal force of the painting. The centripetal force effectively blocked all possible beyond its limit movement, so that any that seemed to be beyond its own force field details were turning back. It was indeed a pipe, but the painter told you that it was not. 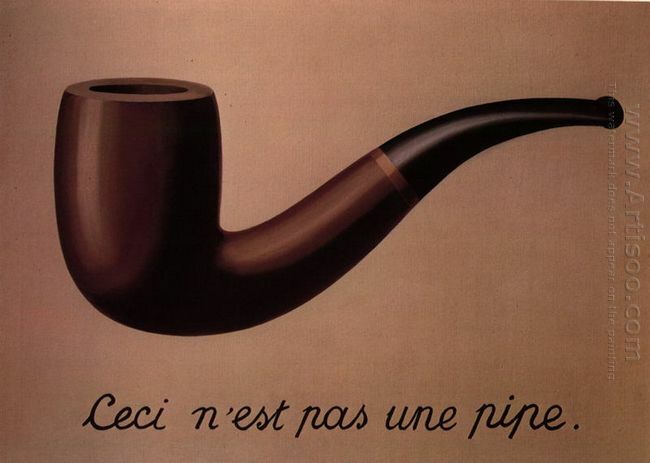 Rene Magritte was a surrealist master, so he said not pipes must have his reasons. So some authoritative critics interpreted this truth. Magritte said, “People could build new relationship between words and objects and can also clarify some qualities that are neglected by languages and objects in daily life.” An idea always lingered in my mind. I thought the secret lied in the operation. But the simplified result belied the operation. However, only the operation could explain the results caused by beyond expression. Graphic design was the secret of Magritte’s operations here, and then was carefully deconstructed. Although the operation immediately disappeared upon completion, the relative position and relationship of each kind of graphic elements and the elements derived from it. These words were professional and difficult for most people to understand. Rene Magritte chose a known classic graphic. According to his own understanding, some quality of life often overlooked “injection in graphics intermediate with art”. Another piece of artwork he had to do was to take this classic graphics in deconstruction, which was his emphasis on “what you see is not a pipe”. From this deconstruction, a new relationship and significance were formed. often neglected in our daily life. This was an interesting question. 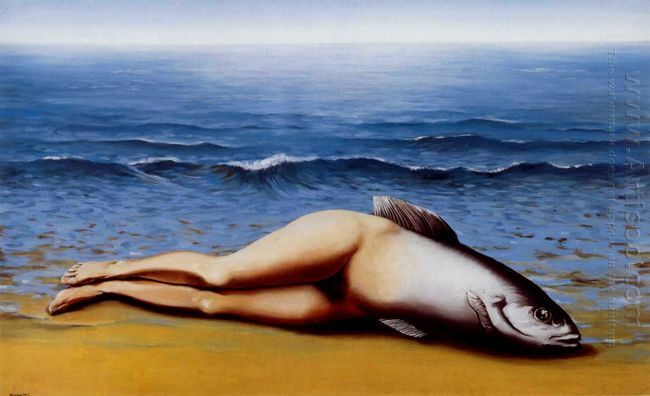 Actually, if taken careful consideration, we could really find many examples to prove the views of Rene Magritte . beautiful, making people reverie. And Renee Magritte departed from his normal behavior and completely subverted the image, giving people a kind of towering feeling, but you had nothing to say, as if entering into a different and strange fantasy world. Margaret thought although this monster and folk legend mermaid were not the same, but also inspired by this imagination image. Since the fantasy was a part of human life, a product of this image was also thought, giving it the weird name of “collective invention”. of Christ was often a thought-provoking question. Mantegna intended to let the audience notice the painful wounds of Christ. Sculpture-like body made the body with a high stereo feeling. Perspective effects made the body, hands and feet beyond the frame of the trauma and grasp the viewer’s heart deeply. No matter in what position the viewer placed in the gallery, his eyes were not immune to the feet and wound. Someone once said that the head was too big, and the foot was too small. In fact, this was due to the use of one eye cast sight caused by. So paint only on a flat surface. Just look at the position of the object with one eye, then you could know the perspective and the proportion of Mantegna is correct. This painting was the painter’s masterpiece, which was an altarpiece. 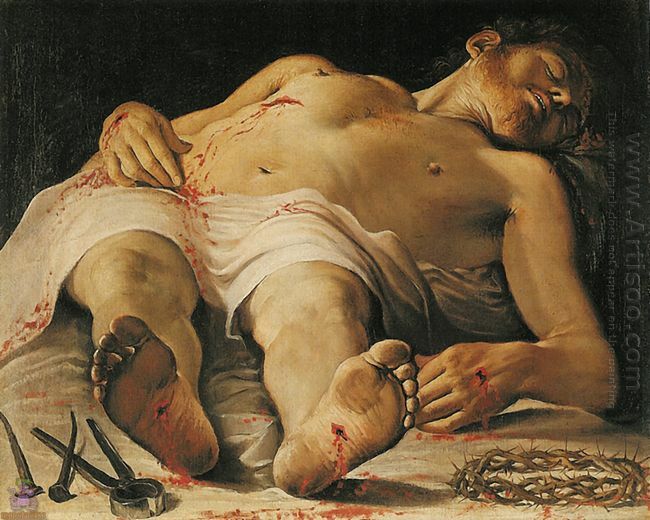 He used the perspective angle which was never used by the former people in the painting and tried to be accurate and true to show the dead Christ’s body. The lines were very sharp and hard. The screen’s characters looked calm, solemn and daunting. The superb art of the painter reflected the tendency of northern Italian art at that time: emphasizing human dignity and heroic spirit, paying attention to the art and science of combining realistic spirit, advocating the artistic description object should be based on the physical basis. This completely accurately reproduced the natural realism tendency of realism art; Italy’s growth had played a certain positive role. Mantegna loved relationship perspective to depict the object from a different angle. He chose the most difficult perspective shortened and accurately plane figures showed the perspective. The most difficult was indeed the Dead Christ with a positive vertical transmission in the painting. The painter did not deliberately focus on the mourning of Christ and tried to draw the human relationship with the X-ray morphology planar, which the painting of people tried to avoid painting artist and visible as a perspective of research. There was another version of this painting, which did not have the mourners on the left. Some art historians believed that the mourners may be later added by Mantegna’s students. Without them, the painting will possess deeper and more solemn sense. However, although the two mourners looked clumsy, the painting was still a profound description of the scene from time immemorial tragedy. Its harsh lines were like metal, cutting the screen, with its troublesome side expressed the theme of the tortured heart emotion. This was the American writer Hemingway said “Mantegna’s Christ suffering nails eyes”. of the largest altarpieces at that time. The positive leniency panels were painted by the patron saint of Siena to worship the mother and son surrounded by the saints and angels. Below was the direct opposite the altar table, depicting 7 scenes of Christ childhood; it was painted with delta frontal virgin life scenes of the life of Christ were painted on the back. The main screen and the most narrative painting are now preserved in Cathedral of Siena museum. 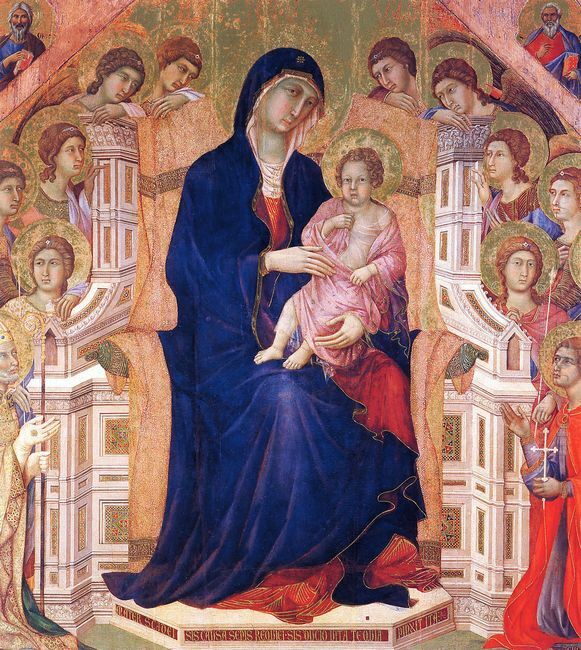 Madonna And Child On A Throne was Duccio’s greatest work. This work was entrusted by the Siena Cathedral and made from 1308 to 1311. When the work was completed, Siena line team escorted Madonna And Child On A Throne to the cathedral, small shops were out of business and steel bells were ringing. But this masterpiece in the future had gone through the fate of dismemberment. Now the world’s several museums were in possession of its local fragments. Both sides of Madonna And Child On A Throne had the paintings: the positive side was composed of three parts. The main part was the scene that Madonna ascended the throne surrounded by angels and saints. The above and below mainly described the later life of Madonna and deeds of Jesus’s childhood (now disappeared without a trace); the back of the painting was Jesus’s mystery. The positive part of body was made with the golden tune, with red and black, the whole scene was beautiful and brilliant. Madonna was wearing a black cloak and sat on her knees benevolence, on both sides of the distribution of angels and apostles symmetrically, the throne decorated with exquisite openwork pattern. The whole painting fully displayed the glory and beauty of a country. Despite of the influence of Byzantine stylized, the composition of this painting was somewhat cautious, the advantages and the depiction of the characters made it an early example of fine small elegant style.